My Name Is Gauhar Jan – these words added spontaneously at the end of a 78 rpm record by one of the most prolific artists of Gramophone Company more than a century ago started a trend in recording, which continued many years after Gauhar’s golden voice faded out. In 1902, Gauhar was requested to record her songs for the first time by the Gramophone Company – she was the reigning diva of Calcutta entertainment industry then. Gramophone Company’s Engineer F W Gainsberg wrote that she was instrumental in ensuring early success for this new medium in India. For every “performance” Gauhar used to charge a princely sum of 3000 rupees! Gainsberg or for that matter, anyone in his place would have been ready to pay that amount for the most popular singer-dancer-entertainer of the era, who could sing in 20 languages and dialects including flawless English. But what astonished Gainsberg more than her singing prowess was her wealth and fashion statement – she always came in a new gown and never even repeated her jewels! Gauhar Jaan gave her maiden performance at the age of 14 at the court of Maharaja of Darbhanga in 1887 and since then came to dominate Hindustani classical music-dance scene for the next few decades. She was pretty with beautiful eyes and had a rich voice but more than that she was intelligent and could floor any connoisseur with her magnetic charm. Her new compositions along with her new fashion styles and quick repartee used to leave her rich patrons spellbound. She was much more than an ordinary tawaif – her rendition of thumris and dadras were copied by budding classical singers, including a young Begum Akhtar. She belonged to that era of transition, where thanks to large-scale concerts at the houses of some of the rich patrons and then with Gramophone records, she could enthrall even ordinary music aficionados. And thus the legend of Gauhar Jaan was born. Even almost a century later, Gauhar still captivates us as the last diva of the pre-silver screen era. A recent book by Vikram Sampat – which very thoughtfully comes with a CD of her songs – captures the mystique of Gauhaar Jaan effectively. I recently also happened to watch a (highly forgettable) Bengali play on her life – Jaan-e-Kolkatta. Angelina Yoward, an Armenian Jew, was born on 26th June 1873 at Ajamgarh, UP. Her father William Robert Yoward was working at a dry ice factory there. Her mother Victoria Hemmings was born and brought up in India and received training in Hindustani Classical music and dance. A few years after Angelina’s birth, Victoria ran away with a minor Muslim noble man. It was then Victoria adopted Islam and changed her name to Malka Jaan and Angelina became Gauhar. Gradually Malka became a famous Kathak dancer and classical singer in Benaras-Lucknow circuit. She came to be known as Badi (eldest) Malka Jaan, as there were at least three other tawaifs of that name then and she was the senior most. With Calcutta – the seat of power and business - emerging as a capital of culture too, Badi Malka shifted base in 1883 and found herself at the court of exiled Nawab of Lucknow, Wajed Ali Shah. It was in Calcutta, Gauhar received training from the best experts of that time. After her first concert, she soon eclipsed other singers and as her record labels proclaimed, she was the “first dancing girl” of her time. She used to go to various royal courts all over India and gave performance at Town Halls in different cities. In 1911, she performed at the Coronation Darbar in Delhi, where along with Janki Bai of Allahabad, she sang “Muarak ho Mubarak ho, tajposhi ka jalsa”. 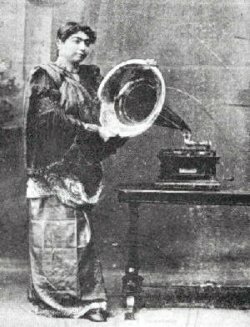 It is believed that her recording of a Khayal in Raag Jogiya in November 1902 is the first Gramophone recording in India. She recorded in her life time a mind-boggling 600 records in different languages and was chiefly instrumental in popularizing light Hindustani classical. Very few people could actually gain entry to her famous Chitpur Road residence or afford to invite her for a performance. But her mystique was partly built on that – an extraordinary talent not easily accessible to public. It is said that Gauhar used to drive past Calcutta Maidan in her huge phaeton and was once fined Rs 1000 for obstructing the passage of the Viceroy, who apparently charmed by her beauty took his hat off and acknowledged her greetings! Gauhar, incredibly rich at the height of her fame, lost her wealth and properties due to machinations of her manager turned husband. Gauhar – Court Singer at different points at Darbhanga and Rampur, finally decided to go to Mysore in late 1928 as a Palace Musician after she lost even her Chitpur Road and Free School Street residences. Gauhar died in Mysore on January 20, 1930. Before that in Calcutta, a broken heart Gauhar was forced to teach young stars, where she reportedly sold a bandish for one rupee but could not bring down herself to accept fees from her students directly. One of her students later recounted how she used to leave coins under the pillows. As Bombay eclipsed Calcutta as the centre of entertainment industry in late 1930s, along with many others this student of Gauhar, Jaddan Bai shifted base to Bombay, where she sang and acted in films. Very few people today remember Jaddan Bai, but all of us know her famous daughter Nargis, who was born as Fatima Rashid in Calcutta in 1929.
technology called additive manufacturing. This technology uses 3D printers to produce real life objects (as per your design) by putting layers after layers of the basic material (hence the name additive). 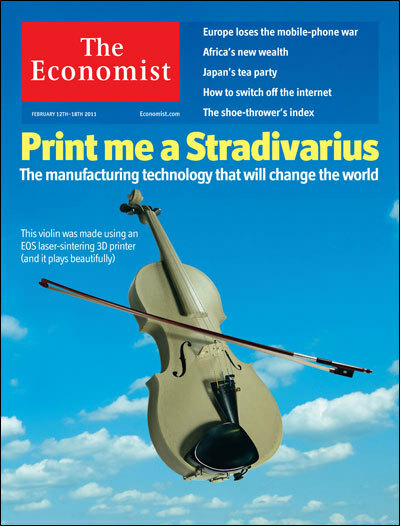 The cover carries picture of a violin made using a 3D printer, which the magazine certifies, plays beautifully. From a simple coffee mug to aircraft parts you can literally create a world of your own with the help of this technology. Economist predicts that if the Industrial era was about mass production then this technology of new generation cottage industry is likely to disrupt the entire socio-economic foundations of the present global economy. There is a long list of possible disruptions from assembly line manufacturing and competitiveness of Asian manufacturers to urban life and intellectual property regime – but one has to agree with the magazine’s conclusion that in the long run it is bound to expand not only the realm of industry but also of human imagination. How far you can expand your imagination while thinking about technologies in the ancient world? No, I am not talking about whether Pushpak raths were actually aero planes or such stuff. As far as our knowledge goes (and honestly that is not very far) the most amazing machine manufactured in the ancient world (of which we have definite material evidence) was almost like an analog computer (albeit for only a given subject). 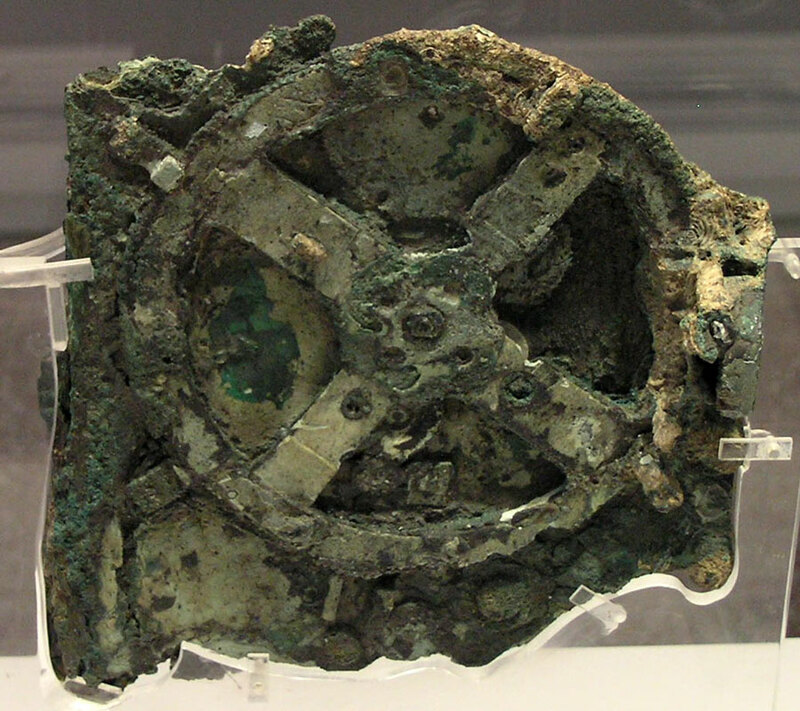 device since known Antikythera mechanism. It took experts actually decades to fully understand how it worked – perhaps because they could not really expand their horizon of imagination and also because certain parts of the machine were lost. Now the device is displayed at National Archaeological Museum at Athens along with a full size reconstruction. Replicas of this amazing device could also be seen in a number of other prominent museums around the world, including at Computer History Museum at Mountain View, Calif. not far from the headquarters of Google. The device is actually a multi-geared programmeable machine, which could predict exact astronomical positions at a given time. In terms of sheer mechanical complexity, the world did not see anything like it till at least 14th century, when mechanical clocks were manufactured for the first time in Europe. The device had over 30 gears (according to one researcher it actually had 72 gears!) and three dials- one in front and two at back. After a date was entered via a hand crank, the device used to give exact position of Sun, Moon and other planets including Mars and Venus on that date. Front dial had three hands to show the date and positions of Sun and Moon. 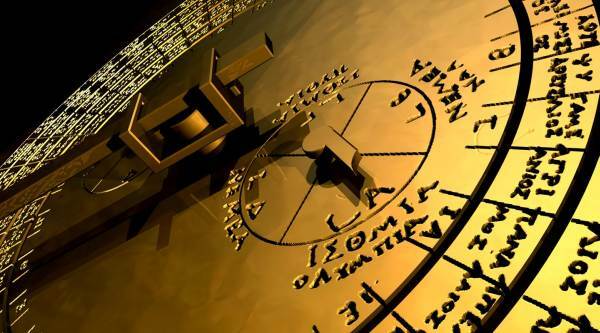 Front dial also contained marks of the ancient Egyptian calendar (Sothic Year) and Greek Zodiac signs. Another outstanding feature of the device was that in all these there were adjusting mechanisms for Leap Year (in Sothic Calendar, till the invention of Julian calendar in 1st century AD no calendar had provision to adjust extra 0.24 days per year) and anomalies in orbits of Sun and Moon. It has now been proved that the actual calculation behind the machine was based on Babylonian astronomy and not on Greek astronomy. But the complexity of the device simply goes on to show the incredible depth of knowledge the creators had in mathematics and astronomy besides their amazing skills in mechanical engineering. The front dial also contains a parapegma, precursor to modern almanac. Two back dials show divisions of Metonic and Saros Cycles respectively – all these were somehow very important in prediction of exact date, timing and planetary positions. It is of course quite difficult for a non-specialist to understand but not so difficult to appreciate the enormous knowledge behind this rather small device. The full size model made by Derek de Solla Price shows how wonderfully it worked. The fact that it was so brilliantly designed and then sort of miniaturized indicates that there was a tradition of such mechanical activity before this particular device was manufactured. Two important questions come to mind – who built this and how the tradition was lost? For the first, there are some speculative answers – one of the latest researchers says it was some way connected with the great scientist Archimedes. Others talk about an academy founded by Posidonius in the island of Rhodes, which was known for its expertise in astronomy and mechanical engineering in ancient Greece. I could not find any answer anywhere in the internet about the second question. There were suggestions that some of the skills behind this device might have survived in Byzantium and then in the Islamic world- but that is hardly a satisfactory explanation. It must be considered a matter of great regret that such advancement in technological knowledge achieved in the second century BC could not be sustained by mankind. Antikythera Mechanism continues to amaze and puzzle us more than 100 years after it was rediscovered.Now there is a full-fledged project dedicated to this extra-ordinary machine-the Antikythera Reaserch Project is fittingly being carried out by a number of Greek Universities , University of Cardiff and computer giant Hewlett -Packard.